Your home back door, one of your most welcomed entrances for thieves, should be secured firmly. However, most of you would skip the back door when making the security plan (Definitely Not!!!). Among 2.5 million home intrusions each year, the back door attack takes up 22% — shocking statistics. 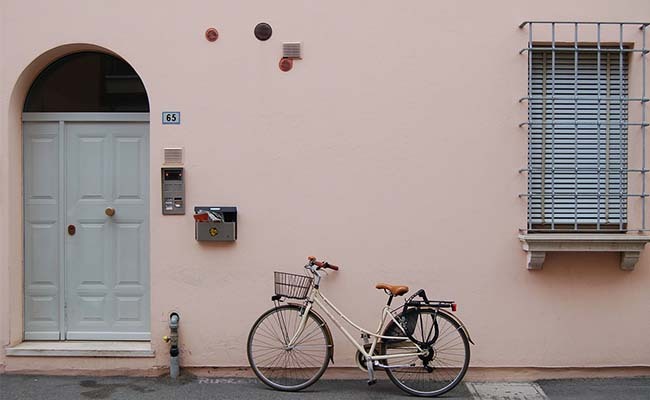 You can try the below top 8 ways to secure your home back door from intruders. Note: Back door has two meanings: 1. A door in the rear of a house or other building. 2. A hidden method for bypassing normal computer authentication systems. The article describes the rear door of a building. You’ll get easiest solutions to secure and barricade your back door from break-ins. No matter what kind of rear doors you have, wooden, glass, sliding doors, etc. you can secure your back door from intruders both inside and outside with the best ways here. Bump: GOT to protect your front door when you try the below ways to secure your home back door. 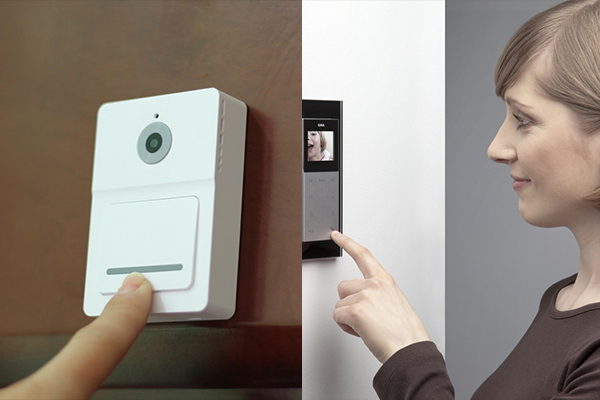 Perhaps a security camera ranks the top among usual back door home security ways. Statistics show that homes without security camera systems are up to 300% more likely to be broken into. Only 17% of the homes in U.S. have a security system. About 53% of home break-ins occur in the daytime when you are at school or work. To secure the back door of your home, it is necessary to install a back door security camera alarm system. No matter what kind of back doors you have, security cameras are undoubtedly one of the best ways to secure your UPVC, wooden, glass or sliding back doors. This camera system paid for itself when it caught a guy burglarizing my shed. The police said it was the best footage they’d ever seen. Thanks to that, he was caught and charged with second degree burglary. You can also watch the below video to see how the security camera Reolink RLC-410WS, the first generation of Reolink RLC-511W, can stop a car break-in. According to the FBI, home break-ins are the most common threat to our home. To secure your home back door, you should pick a solid-core door. To choose the best back door for your home security, you need to make sure that your back door is made from the listed materials: fiberglass, metal and wood. Doors made of the 3 materials are 3 best and safest exterior home back doors. 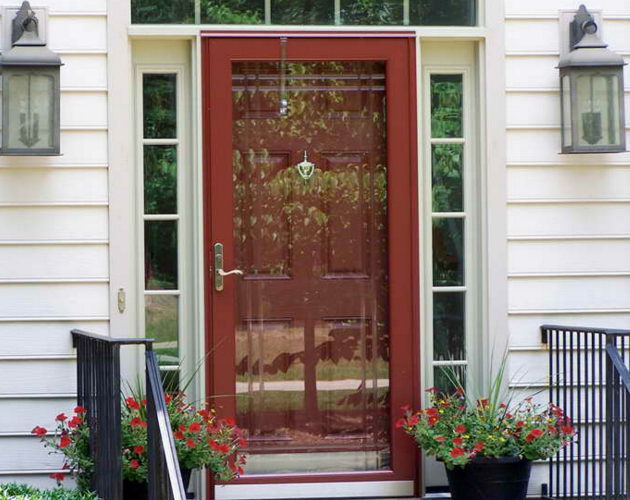 Fiberglass doors rank the first among three materials. This kind of door has all the advantages of metal and wood doors. Metal doors are commonly used as home back doors. This kind of door offers strength and durability and is an economic option. Wooden back door security gates are also good for protecting your home. Make sure that it is strong enough. More and more people like using sliding glass doors as back doors. This kind of door is usually secured by latches only, which is easy to be kicked in. How to secure your sliding glass door from the outside? The below 5 tips could be helpful. A. Install a metal back door security bar & grille in the middle of your sliding door. It won’t give the intruders any leverage points to pop your door off the track. Thus, you can secure your back door from being pried by intruders. If your back door has windows, don’t forget to add security bars to harden your back door window security. B. Use a dowel rod to ensure your glass back door security. A dowel rod is a cylindrical stick and is used to insert the track of sliding glass door. Even a thief unlashes the latch, he can’t open the door with the dowel rod holding it shut. It’s one of the best ways to secure your back door from the inside at home. C. Choose strong glass to reinforce your house back door security. To secure your home back door, you should choose strong glass rather than tempered glass for your entry back door security. Consider double-paned glass or glass with embedded wire to ensure your glass back door security. D. Use back door security screens and other coverings. Curtains are effective, inexpensive and easy to install to cover your sliding glass door. With coverings, intruders can’t see the stuff of your home, which makes your home an unwelcomed target. E. Choose a double back door security bolt lock. It secures the door to the frame at two security points and prevents any movement of the door. It’s an effective way to boost your front and back door security. In the UK, the use of euro profile locks technique and bump keys has dramatically risen over the last 5 years. To protect your back door in the UK or any other places, a high-quality back door security deadbolt lock is essential. Keep it in mind that the secure deadbolt lock for your house back door should extend an inch or more into the doorjamb opening. Since most houses have wooden doorjambs, it is quite important to confirm that your deadbolt comes with a large strike plate and is secured with at least four screws, which should be at least 3 inches long, to prevent them from being easily ripped free. It is reported that about 30 percent of all burglaries are through an open or unlocked window or door. To secure your house back door, you should always lock your door anytime. Remember that a lock is a lock unless you use it. You can set up push notifications on your smartphones, or put up a post-it note on your fridge to remind you to lock the back door before going out. In the U.S, a home burglary occurs every 13 seconds. How to secure your back door from burglaries? An easy way is lighting. Burglars like searching houses with no one at home. Interior lighting is a sign of activity inside. To burglarproof your back door at night, installing a night timer is really helpful. They should be used on a daily basis, not just when you are away or on a vacation. The lighting routine could reduce the risk of break-ins. According to statistics, about 27.7% of burglaries happen at night, and the odds are these ones end up being more dangerous. Back door security light indicates that your home is occupied, which can deter those would-be crooks in the first line. You can check the effectiveness of outside lights on deterring burglars in this post. A dog with sharp teeth and noisy bark is definitely a good guard for securing your back door. When a stranger comes near your back door, the dog will bark fiercely, which will attract other people’s attention. A dog may not scare an intruder once he is in the house, but he certainly would give the would-be criminal reason to look elsewhere. However, a dog is a life. You need to have patience to raise it as a family. Love and care will make your dog more loyal and willing to protect your home from invasion. You can read this post to see the effectiveness of a dog on protecting your home from break-ins. Nice neighbors should look out for each other. To get along well with them, you could invite them to your house, communicate often and establish mutual trust. You can ask them for helping you watch out your back door while you will do the same for them. You can start a neighborhood watch program right now to look out for each other’s back door and home security. You should keep it in mind that it is necessary to install wide-angle viewers on all exterior doors including the neglected back door, especially solid and opaque doors. The viewer enables you to see who and what are outside without opening the door. Police usually only clear 13% of all reported burglaries due to lack of witnesses or physical evidence. The most frequent season of burglary occurrence is summer. In this summer time of 2016, you should try the above top 8 ways to make your back door bump-free and safe from break-ins. For not becoming the victim of home break-ins in this excellent summer season, please share these ways with your family, friends and loved ones. Warn them the dangers of home break-ins and tell them the above ways to prevent back door attack. Don’t make your home become an easy target of home break-ins. A penny for your thoughts on “How to secure your home back door?”! Share your excellent tips to secure your home in the comment below. We will feature your opinions in this post! This entry was posted in Expert Safety Tips and tagged Backdoor Security Tips, Secure Back Door. When not diving into writing about home security, Elvia spends her time watching movies, hiking, reading, etc. Also, she is a big fan of Star War and Orphan Black. Hello Alex, glad you like this post. If you have other tips to secure the house back door, please share with us in the comment!